The round robin is over and the teams are down to four heading in to Saturday's semifinal action. Canada and Russia played and one team went home. There was a scare for all of 90 seconds for Canada. 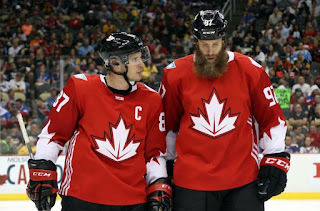 Russia took a lead in the 2nd, after successive goals, and there was wonder, "Is Canada coming undone?" Russia was matching skill with Canada to the best of their abilities while Sergei Bobrovsky stood on his head and for a while you wondered if Canada had met its match. Instead Canada surged when it mattered most, taking over the game and scoring four straight goals en route to a 5-3 win that saw Alex Ovechkin suffocated all evening, registering only one shot on over 20 minutes of ice time. And assisting on the next two Team Canada goals, he had another prolific night when the spotlight shined brightest. One goal, two assists, and the second star of the game. Meanwhile Evgeni Malkin assisted on the first goal of the game for Russia. Patric Hornqvist and Carl Hagelin, representing Team Sweden, take on Team Europe to see who will play Team Canada in the finals. That game gets underway at 1:00pm EST on ESPN.